The GE GPS 4848/100 Galaxy Power System is a 48 VDC Large Power Plant H569-434. The industry standard for telecom power, the GE GPS 4848/100 Galaxy Power System is the first choice to meet DC power requirements of large central office and mobile switching office applications. 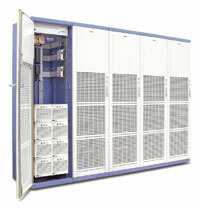 The GPS provides output capacities up to 20,000A in an integrated, multi-cabinet configuration. True 3-phase 3-wire rectifiers operate on commercial 208/240Vac or 480Vac. The Galaxy Millennium II controller provides detailed system management and flexible control of GE and third party equipment. This flagship controller simplifies operations and maintenance while lowering administrative costs. Remote peripheral modules support over 500 monitoring points for GE or third party devices. Ethernet, SNMP, and TL1 provide integration and surveillance of system-state conditional reporting and capacity management. The system can be deployed in centralized or distributed system architectures. GPS provides industry leading capacity of up to 3080 Amps in a single cabinet which can scale to 20,000 Amps in a multi-cabinet system solution. A single Millennium II controller links all components of the system, while intelligently interacting with the local and remote Ethernet networks. The 595LT-TE rectifier integrates proven technology with superior control features in a compact, cost effective solution. This highly efficient rectifier platform provides unparalleled performance maximizing system investment approaching 96%. The 595LT-TE series offers two modules for use in -48V applications.